Home / Window Cleaning / Can Residential Window Cleaning Increase the Lifespan of Your Windows? Remove Contaminants: Regularly removing any dirt and debris from your windows that may cause corrosion is an easy and effective way to increase their lifespan. A residential window cleaning company will clean the glass frames and sills to ensure these contaminants don’t build up and won’t cause any harmful effects to your windows. Do Preventative Maintenance: Regularly scheduled window cleanings will keep you aware of any issues that need to be addressed. The highly skilled washers at All County Window Cleaning are trained to recognize any peeling caulk or cracking that might cause damage to the glass or the surrounding areas of your windows. If they spot any signs of an issue, they’ll alert you before bigger problems occur. Maintain Functionality: Besides letting light in, windows also need to function and be able to open and close properly. Residential window cleaners will scrub the tracts on any sliding windows and remove dirt, debris, and insects to ensure they will function correctly and last longer. These are just three of the ways that you’ll increase the lifespan of your windows in your home. There are various other ways Residential Window Cleaning can Increase the Lifespan of Your Windows, and our window cleaning professionals are here to help. Clean, clear windows let in natural light and brighten the rooms in your home. But most people don’t maintain and clean their windows as often as they should, and this can shorten the lifespan of the windows. 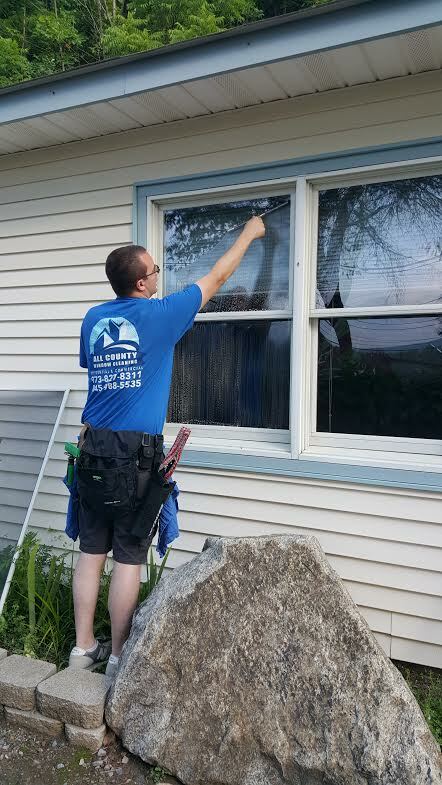 All County Window Cleaning in Vernon, NJ, is a residential window cleaning company that provides the northern New Jersey and upstate New York areas with high-quality, professional services. Their team of experts will extend the life of your windows by performing regularly scheduled cleanings. If you are ready to leave the window cleaning in your home to the professionals, let in more light, and increase the lifespan of your windows, contact All County Window Cleaning today. Call (973) 827-8311 to schedule an appointment.